We all have a hit list of favourite shops to splash our cash in, but with so many amazing fashion stores on offer in Liverpool - we're going to explore a killer way to while away an afternoon shopping till you drop. Looking for something old, something new, something borrowed? This shop is the perfect choice for those who love anything vintage and individual. Step into a two floored quirky designed outlet to feast your eyes (and cash) on funky coloured tops and denim galore. Affordable retro fashion for anyone that wants to switch their wardrobe up and take a step back in time to when fashion was at its peak. High street fashion at its best. The big named brands are all in here to dress you for work, socials, the gym or a night out – whatever the occasion, Topshop is sure to have it. Don’t be fooled by the name, the jeans at Topshop are personally my favourite, they do a great selection, in store, that offer jean sizes for those who are tall and those who small. Remember to pose in the photo booth on the second floor – the perfect lighting makes the perfect Insta! 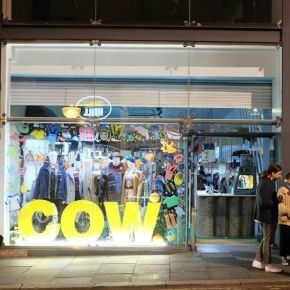 What we’d call a mix between Topshop and Cow – a little bit of retro, with a little bit of today’s most famous labels, such as Adidas, Calvin Klein and Nike to name a few. It’s not just the best fashion you can get your hands upon, there’s also a range of books, records and the cutest furniture. For those who love a selfie in Liverpool, why not try Urban Outfitters’ photo booth too? The most affordable fashion in Liverpool. Primark is a guilty pleasure, why not make it yours? This five floored paradise full of clothes, shoes, makeup, accessories and furniture is perfect when you want to treat yourself, but don’t have the most money. Primark also has a beauty bar if you need a break from shopping to receive affordable, but well completed beauty treatments. The nicest things for the nicest prices. You’ll find the most amazing formal wear in here, whether that be for a wedding, a party, a ball or if you just want to feel a million dollars - Dress2Party is red carpet worthy fashion. I dare you to go to this boutique and try to find something that doesn’t sparkle, but I also dare you to go with a purse full of cash, because Dress2Party isn’t the cheapest, but you’re definitely getting the best quality designs here, so that money is definitely well spent! Going into town is always an enjoyable day, whether that be because of the great food options, bars, shops or just the general fabulous atmosphere. Next time you take a trip into Liverpool, why not try one of these shops – you never know, you might find yourself a great buy!